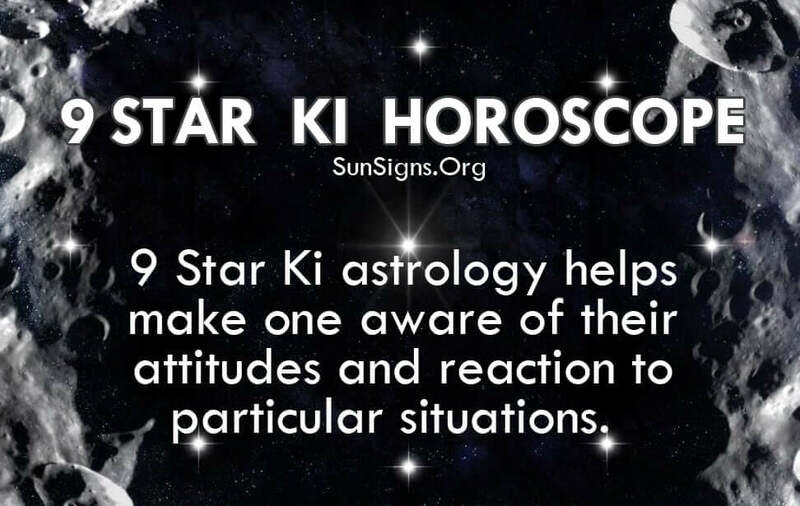 9 Star Ki horoscope helps make one aware of their attitudes, and reaction to particular situations. The 9 Star Ki astrology reading can assist you in becoming a better individual but also lets us gain understanding of others in our lives. The 9 Star Ki astrology reading is free, accurate and quick. Get your 9 Star Ki Chinese Astrology Reading immediately. This is a form of oriental astrology strongly connected to the I Ching. 9 Star Ki astrology combines the magic square (lo shu) with the I Ching. For more than 1000 years this branch of Japanese astrology has been with us. The term Ki would most simply be explained in English as the term energy. 9 Star Ki Astrology will provide you your 9 Star Ki numbers, your natal chart, your element according to 9 Star Ki astrology and love astrology predictions in regard to your relationships. Among the Japanese, 9 Star Ki astrology is the method most commonly used to determine the 2016 daily horoscope. They also will often look at relationships in terms of the Nine Star Ki method. There is also a strong connection to Feng Shui “magic square” or what is more commonly referred to as the lo shu. A standard 9 Star Ki zodiac prediction utilizes the principle number, the character number and the energy number. Each of these numbers has a different significance. The principle number is reflective of your inner disposition; it is the number that indicates your birth pattern. The principle number tells a great deal about your disposition, the personality and the positive and negative traits in your character. The character number reflects how you act until you become a teenager. This number also indicates how a person copes with stress, obstacles and the challenges in life, and how resilient we are. The energy number rules over how we are seen by others especially when meeting for the first time. The energy number actually does represent the view others will have on your first meeting. So make the most out of it with this free Nine Star Horoscope.